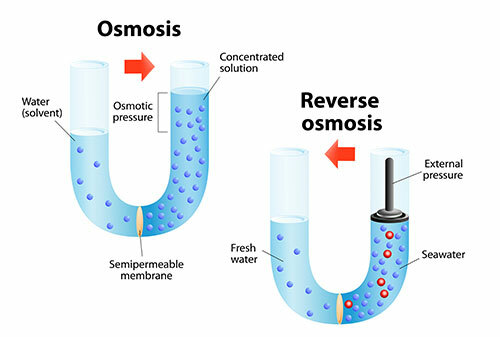 Reverse osmosis is a water filtration technique that involves passing water through a membrane that eliminates particles and debris. For many people, the word “osmosis” is enough to make their heads spin, let alone know how this process actually works. In reality, it’s quite simple. Imagine putting a barrier with microscopic holes between impure water and pure water. Now, these holes allow water to pass through the barrier effortlessly but are too small for microorganisms to pass through. These microorganisms might include various bacteria, germs, chemicals, or other water contaminants. Remember, the holes in this reverse osmosis membrane are SUPER small. The result of this process is that the water filtered through reverse osmosis is stripped of nearly every impurity you may find. Why use reverse osmosis on your water? Sure, water filters get a lot of the bad stuff out of your water, but they don’t get all the “junk” out. There are still many impurities and contaminants that can be left in your water even with some of the best name-brand filters on the market. Furthermore, most water filters alone cannot strip harmful bacteria from the water. If “good” drinking water isn’t enough for you and you want the very best in water purification, then a reverse osmosis system might be exactly what you’re looking for. Home Water Solutions’ whole house water filter uses reverse osmosis technology. What makes our reverse osmosis filters different? Unlike most reverse osmosis filters, our reverse osmosis technology then puts the treated water into a storage tank that is then filtered once more before dispensing some of the cleanest water you’ve ever tasted. Even after a single use of our reverse osmosis filters, most of our customers say the results are unmistakable. Virtually everything from coffee and tea to pasta and steamed veggies are more flavorful thanks to reverse osmosis filtration. As is the case with most types of devices that treat or filter water, a reverse osmosis system is added between your main water line and the tap. The type of reverse osmosis system that we’d recommend really depends on your specific needs. At Home Water Solutions, we offer whole-house as well as kitchen-only systems. If purchasing a reverse osmosis system sounds like something that interests you, we’d encourage you to contact us and set up a no-obligation consultation.